Now offering the Kandice Cota Via Asia Clothing line. All clothes come packaged as displayed. See selection of clothing offerings below. 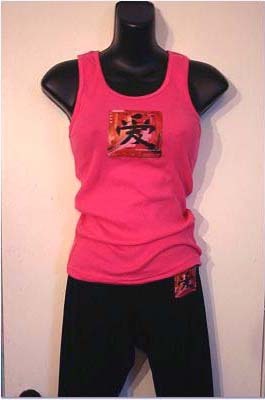 Fuschia beater tank top and Black yoga Pant set with Love Candy emblem (based on Kandice's Via Asia collection) on each piece of clothing. This is a hot new look for the yoga enthusiast or just fun for hanging around. 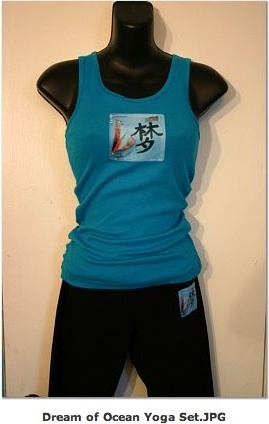 Teal blue beater tank top and Black yoga Pant set with Dream of Ocean emblem (based on Kandice's Via Asia collection) on each piece of clothing. This is a hot new look for the yoga enthusiast or just fun for hanging around. 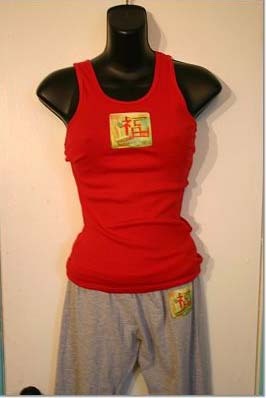 Red beater tank top and Gray yoga pant set with Luck in Health emblem (based on Kandice's Via Asia collection) on each piece of clothing. This is a hot new look for the yoga enthusiast or just fun for hanging around. 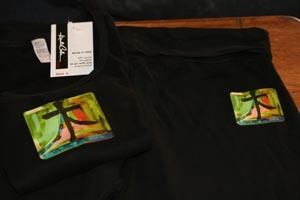 Black beater tank top and Black yoga Pant set with Tree of Life emblem (based on Kandice's Via Asia collection) on each piece of clothing. This is a hot new look for the yoga enthusiast or just fun for hanging around. 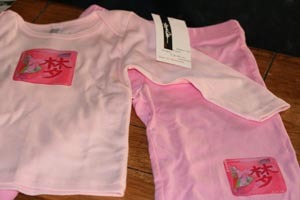 Below are the baby karate sets. The are so cute! Baby Girl - Dream Girl Karate Set. 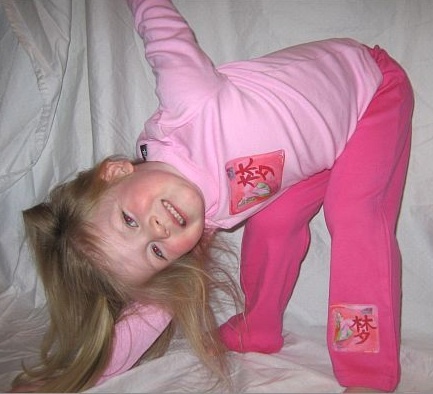 Light Pink longsleeve top top and hot pink Karate Pant set with Dream emblem (based on Kandice's Via Asia collection) on each piece of clothing. This is an adorable outfit for any baby! Baby Boy - Celebrate Surf Karate Set. 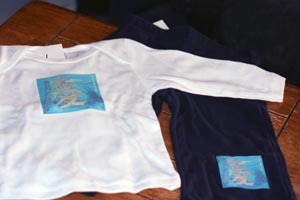 White longsleeve top and navy Karate Pant set with Celebrate Surf emblem (based on Kandice's Via Asia collection) on each piece of clothing. This is an adorable outfit for any baby!